Day 1 – Depart the US for Amsterdam (AMS). Day 2 – Upon arriving at Kilimanjaro, you will have your visa processed and collect your luggage. 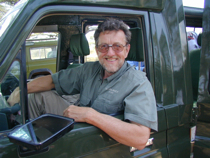 You will be met by your Awaken to Africa driver/guide, who will drive you to Kigongoni Lodge for dinner and overnight. Day 3 – After breakfast you will drive southwest to Tarangire National Park, home of one of the largest elephant populations in Africa and the exotic baobab trees. You will game drive in the park for the day, arriving at your lodge in time for dinner. Tarangire Safari Lodge sits on a bluff overlooking the Tarangire River, which is an attraction for wildlife as it is the main watersource during the dry season. Dinner and overnight at your lodge. Day 4 – Today you will game drive in this large park enjoying the elephants bathing in the swamp on the east side of the park. Perhaps you’ll be lucky and see the wild dogs, which have been seen in the park. You may also see lion, cheetah, baboon, leopard, impala, zebra, ostrich, and oryx. Tarangire has over 300 species of birds and has the highest recorded number of breeding bird species of any habitat in the world. At the end of the day, you’ll return to your lodge for dinner and overnight. Tarangire Safari Lodge also has a pool for your enjoyment. Day 5 – After breakfast you’ll depart Tarangire for Lake Manyara and the national park, which is located along the western wall of the Rift Valley. As you drive west toward Lake Manyara, you’ll pass through the town of Mto wa Mbu (Mosquito River). You may also choose to stop at a Maasai village near Lake Manyara. You’ll spend the day in Lake Manyara National Park, a wonderful gem of a park where you’ll see impala, lots of baboons, more elephants per square kilometer than any other Tanzanian park, lions (perhaps in a tree, for which Lake Manyara has become famous), hippos, maybe a leopard, and the little dik diks and klipspringers. Later in the day you’ll enter the Ngorongoro Conservation Area and drive to the Ngorongoro Crater, a World Heritage site and the world’s largest intact volcanic caldera. You will see rainforest habitat on one side and the Rift Valley on the other. The view is breathtaking. The rim is situated at 7,500-8,000 feet, and your lodge is sited right on the rim, overlooking the 12-mile wide, 2,000 feet deep crater. You’ll have dinner and spend the night at the crater rim. Day 6 – Early in the morning you’ll head down into the crater. You may choose to have breakfast before you start out for the crater floor, or you can take a packed breakfast to take advantage of the early morning light (and try to beat other vehicles down into the crater). Lunch will be in the crater, perhaps beside the hippo pool. The crater ecosystem includes grassland, swamp, acacia forest, and a central soda lake (Magadi), which is filled with thousands of flamingoes. Wildlife viewing is excellent, and you will have wonderful photographic opportunities. If you’re lucky, you’ll see one of the protected rhinos that inhabit this amazing place. There are approximately25,000 to 30,000 large mammals that live on the crater floor along with a wide variety of exotic birds. Later in the afternoon you’ll take the ascending road up to the craterrim to your lodge for dinner and overnight. Day 7 – After breakfast you’ll leave the Ngorongoro Crater and drive north towards the Serengeti, stopping along the way to visit the Oldupai Gorge, site of Louis and Mary Leakey’s important archeological discoveries and, until recently, the earliest ever excavated evidence of human existence. You will arrive in time for lunch at your tented camp for the next three nights—Lake Masek Lodge. After lunch you’ll begin to explore the Ndutu area of the Serengeti eco-system. You’ll be looking for the wildebeest migration herd, which should be found in this area of the short grass plains. Dinner and overnight at your tented camp. Day 8 & 9 – Your lodging for the next two nights is in the southern part of theSerengeti eco-system. It is actually located in the Ngorongoro Conservation Area, but you’ll be driving into the Serengeti National Park as well. Thisentire area is known as the Ndutu part of the Serengeti, and the wildebeest migration herd spends the first part of each year in this area. The rich grass that is found in the short grass plains contains nutrients and minerals needed for milk production. This is the calving season for the wildebeests, and all the females give birth within a 2-3 week period. Lunch will be in the bush with picnic lunches, or you’ll drive back to the lodge for lunch. In the afternoon you’ll head out again on a game drive until it’s time for dinner. Dinner and overnight at your tented camp. Day 10 – After breakfast you’ll have one last game drive as you slowly drive to the airstrip for your flight back to Arusha. At the Arusha Airport, you’ll be met by a representative of Awaken to Africa, who will drive you to Shanga, a workshop for the disabled. At the workshop the employees recycle bottles into beautiful beaded art objects. You may visit the workshop and the gift shop while at Shanga. Lunch will be at the River House, a small restaurant on the beautiful garden grounds of Shanga. Later in the afternoon you’ll drive to Kigongoni Lodge, where you’ll have a dayroom and dinner. At Kigongoni you can just relax, swim in the pool, or re-pack. In the early evening you’ll be transferred to Kilimanjaro International Airport for your evening flight to Amsterdam. Day 10 – After breakfast you’ll have one last game drive before heading to the Ndutu airstrip. You’ll say good-bye to your driver/guide before boarding the Coastal plane for your flight to Kigali. Arriving in Kigali, Rwanda, in the late afternoon, you’ll be met by our Rwanda ground operator partner and transported to your hotel for dinner and overnight. Tonight you’ll have a briefing on your Rwanda schedule. Day 11 – After breakfast you’ll be enjoy a city tour of Kigali, including a visit to the market and a pottery project. You’ll have lunch at the Bourbon Restaurant in Kigali before departing the city for Ruhengeri. The journey north goes through beautiful, terraced hillsides that characterize much of Rwanda’s landscape, gradually climbing to the base of the awesome Virunga volcanoes. You will have dinner and spend the night at the Gorillas Nest Lodge, which is just a few kilometers from Volcanoes National Park (Parc National des Volcans or PNV). Day 12 – Your first gorilla trek will begin early in the moring as you drive a short distance to the park entrance to gather with the other people who will trek that day. There are 8 groups of habituated gorillas, and you will be assigned to a family group for your 1-hour visit with the mountain gorillas. You will trek with a guide and the others in your group of 8 visitors until you locate the gorilla family and spend approximately an hour with the family. Some gorilla families are more elusive, and tracking can take a while, especially when it is wet and muddy. Lunch will be at the Iby’Iwacu Village, which borders the park. At the village you’ll have a wonderful, interactive experience, learning about Rwandan traditions, culture, song, and dance. Dinner and overnight at the lodge. Day 13 – Another early morning departure for the PNV and your second gorilla trek. Lunch will be in Kinigi at La Paillotte. After lunch you will drive to Gisenyi, a port at the northern end of Lake Kivu, one of the deepest and most voluminous freshwater lakes in the world. It runs for about 100kilometers along the border between Rwanda and the Democratic Republic of the Congo. Along the way you will visit Imbabazi Orphanage, begun by Rosamond Carr in 1994 to shelter some of the many genocide orphans and displaced children. It is home to about 100 children, ages 7 to 21. Dinner will be at a small restaurant/hotel on Lake Kivu—Malahide Paradis. Overnight at the Lake Kivu Serena Hotel. Day 14 – You’ll enjoy breakfast looking out over Lake Kivu. After breakfast and a brief drive through Gisenyi. As you drive north towards Kigali, you’ll have lunch. This afternoon you’ll drive back through Kigali, and about a half hour outside of the city, you will visit the Nyamata and Mtarama Genocide Memorials. At Nyamata about 10,000 people gathered at the church, seeking refuge and safety. But, in April 1994 they were all killed by the Interahamwe and army. Dinner will be at the New Cactus restaurant and overnight at the Mille Collines Hotel. Day 15 – This morning you’ll have breakfast on the top floor of the hotel with a fabulous view of Kigali. There will be a last opportunity for some shopping before heading to the Kigali Airport, stopping along the way for lunch, and your 2:50 p.m. flight back to Tanzania. Upon your arrival in Kilimanjaro International Airport, you’ll have a chance to eat a light supper at a local restaurant before your evening flight to Amsterdam.